CLINIQUE has one of the most wide ranging selections of foundations of any beauty brand. There is a solution for every skin type, condition and desired finish. Now they've created a foundation for those of you who need more coverage - but still don't want it to feel heavy or cakey. 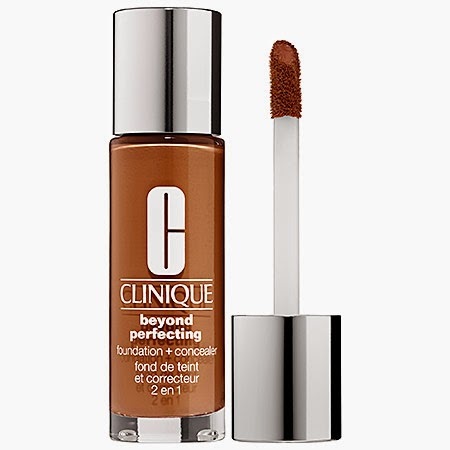 CLINIQUE Beyond Perfecting Foundation + Concealer is a fuller coverage, long wear foundation that took care of my foundation and spot concealing needs all at the same time. The formula is thick and creamy on the applicator, and when I applied it to my skin, it had a nice amount of slip, felt like air, and glided on to my skin easily, allowing me to quickly get to all the areas of my face. The finish was what I would call "semi-matte". It did give a bit of a subtle glow, but it appeared otherwise matte. I did not need any additional concealer, but depending on your skin's issues e.g. dark circles, acne scars, etc., you may need to add a touch of concealer as well. Note: I had the best application results with either the CLINIQUE Beyond Perfecting Foundation + Concealer applicator + fingers, or with my beautyblender. My best color match was 26 Amber (shown, above). It's very concentrated, so about two dabs of the applicator sponge is all I needed for a full coverage finish. Once the foundation was applied, it did take a full minute or so to set and dry completely. But once it did, I was more than impressed with the coverage. It gave me the look of even, polished skin without a heavy look or feel. Beyond Perfecting Foundation + Concealer lasted all day, with no flaking or rubbing off. It's also perfect for more oily and combination skin as it does have oil-control properties. But what I loved about it was that it also it didn't make my drier areas dry. This is a perfect foundation for photos and on-camera work. *This product was provided courtesy of CLINIQUE PR for reviewing purposes.